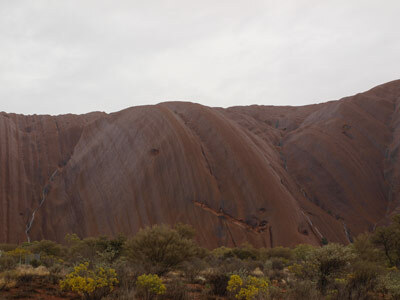 A closer view of this section of the trip, especially the Uluru area. Sure enough, it rained during the night. About 2 am it started. It was very heavy at times. It rained non-stop for three hours. I wonder how much rain fell? 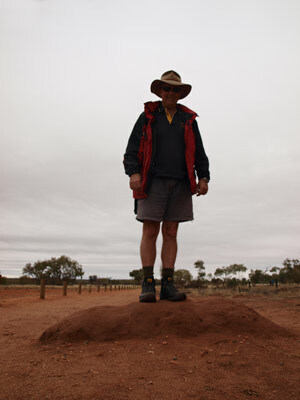 According to the Bureau of Meteorology web site, 12.2 mm fell at Watarrka which is nearby. We get up at 7:15 am and pack up as it is not raining. We head off at 8:30 am. 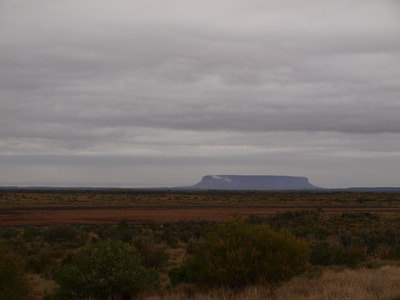 The temperature has risen to 18ºC and it is sprinkling a bit as we head to Yulara. At 10:17 am we stop at a rest area for morning tea. We have travelled 155 kilometres this morning on the good tarred road. We leave at 10:32 am and then stop at the Mount Connor Lookout at 10:40 am (there are toilets here but not at the rest area I think). There are lots of buses stopped here, big and small. 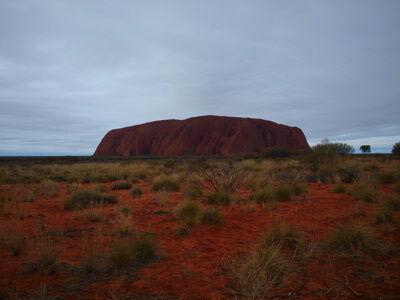 We take a couple of quick photos of the Uluru look-alike and head off at 10:40 am. 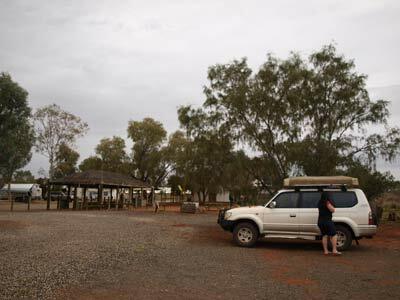 We arrive at Yulara Resort at 11:55 am, travelling 270 kilometres from Kings Creek in the three hours and 25 minutes. We book in for two nights at a cost of $17 per person per night. We get allocated a site which is a real nice one, right near the toilets and gas barbecues but one which has vegetation around it. Peter F and Tomas have problems as they want a powered site. The first one they give them is totally crap and the next one okay. They will have to erect their tents to grab the site as they have been allocated to an area which holds say five or six tents. Kelly and I head off as we will have to wait forever for them. We get to Uluru ($25 entry fee per person to the national park which is for three days) and have lunch at the base of the climb. As it is raining, the climb is closed. In fact, some tour operators say that it is open as few as 50 to 70 days a year. Based on my experience, this is correct, as in the six days I have spent there, it was only open one day. 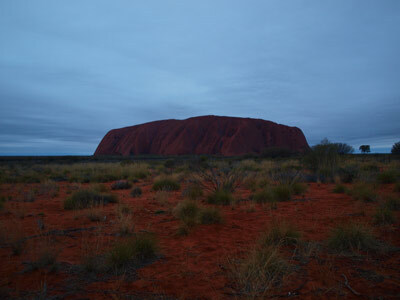 In any case, I have no intention of climbing Uluru, not because the Aboriginal community does not like it, but because I have done once and it is too hard to even think about doing again. 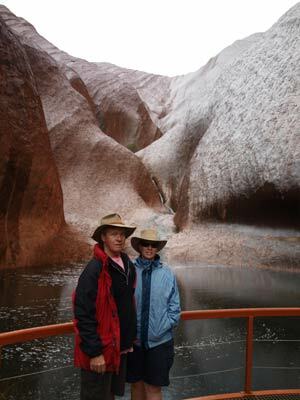 After lunch, we head off on the walk around the base of Uluru (Ayers Rock). This is about nine kilometres and absolutely flat. However, the rain has made some sections muddy and we have to divert a bit off the track in places. We start at 1:35 pm and need to put on wet weather gear. It really is amazing to see the huge rock wet, with small streams of water flowing down the valleys. Apparently this morning there were rivers and waterfalls. Damn, I would have liked to see it like that! While the northern section of the walk is a bit boring, you cannot take photos and the walk goes a bit away from the base, the eastern side was great. 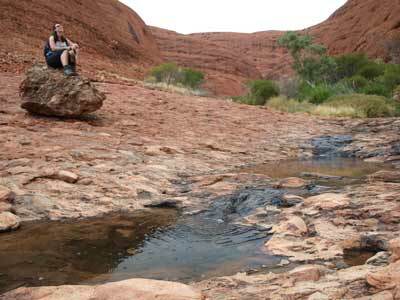 The Mutitjulu Waterhole had heaps of water and quite beautiful. We complete the walk at 4:35 pm, taking exactly three hours to walk the nine or so kilometres. It is an easy walk, although the wet weather made it a little more difficult as you needed to watch your step in spots. We head to the sunset viewing area. We are being optimistic that the weather will clear a bit and there will be a bit of sun. We take our preferred spot (towards the end of the car park) and set up our chairs. We read some more while we wait. As sunset approaches, there are not many cars here, perhaps only 20% of the car park is full at the most. Compare this to 120% the last time I was here. At 6 pm we break out a bottle of sparkling wine and some cheese and biscuits. The sunset is at 6:30 pm and while the colour does change a bit (see the photos), it is nothing like a cloudless sunset. We leave at 6:45 pm and arrive back at the camping area at 7:00 pm. 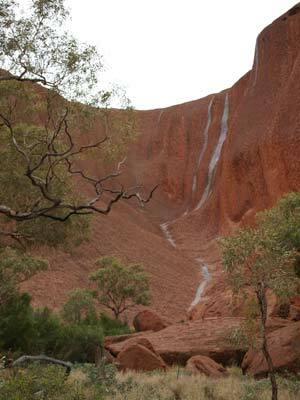 We have a quick shower and then walk up to the nearby Outback Bar for drinks and dinner. It is packed when we get there. Tomas and Peter F have been here for a while as they did not do the walk to go to watch the sunset. We get some food and drinks and Kelly cooks hers and mine on the barbecue. We both have crocodile and kangaroo skewers with beef sausages and all the salad you can eat. This cost $27.90 each. There is an excellent one man band playing and after dinner we move closer to the stage. Kelly and I end up staying till he finishes at about 11 pm. I think we may have one or two more beers than we should have had. During the evening it rains a bit. We were late getting up, 8:35 am. Must have been because of the late night, nothing at all to do with the beers we drank. We need to get fuel so after breakfast, we go to the fuel station. We take 132.4 litres @ $1.87 a litre = $207.87. We head off from here at 9:45 am. 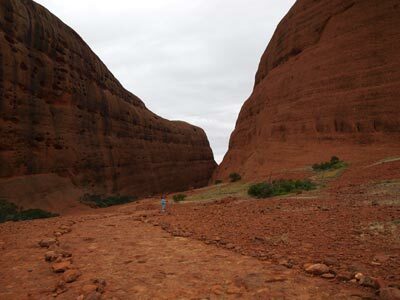 At 10:10 am we arrive at the sunrise viewing area for Kata Tjuta (The Olgas). 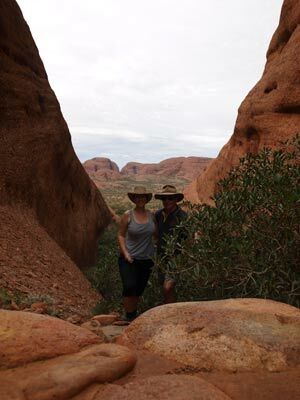 A short walk to the viewing area gives some great views of The Olgas. We leave at 10:25 am and arrive at the Valley of the Winds at 10:45 am. It is 54 kilometres from the resort to here. 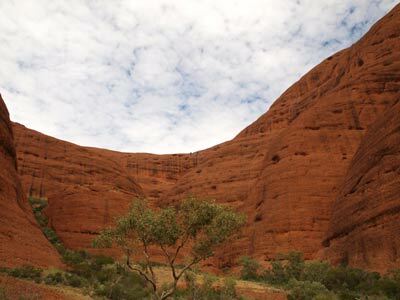 The Olgas consist of 38 individual rocks, all varying in sizes. 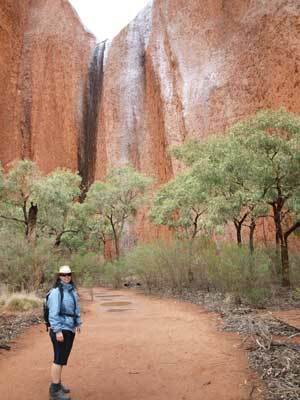 Kelly and I plan to do the 7.4 kilometre Valley of the Winds walk. This is a very easy walk, with no steep sections and is said to take three hours. 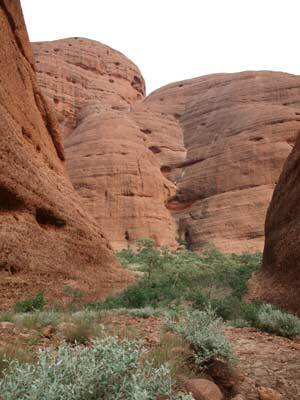 The first thing you notice about The Olgas is that the rock is totally different to that of Uluru. 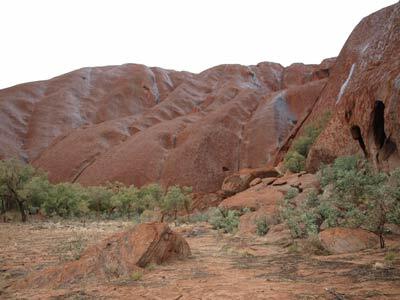 While Uluru is sandstone, The Olgas rock is conglomerate, with small and large rocks cemented together with sandstone. The rocks are basalt and granite. After a short walk to the lookout, you drop down into the valley behind and then start threading your way between the larger of the rocks. The scenery is truly dramatic, with shear walls of rock rising straight up out of the valley. After about an hour and a bit you drop down into a much larger valley. Then you thread your way back to the start. It takes us two and a half hours to do the walk, with plenty of stops for photos, sightseeing and just taking in the ambiance. We are back at the car at 1:35 pm and then drive back to the picnic area as there are no toilet or other facilities at the walk's start. On the way we see about 20 camels on a nearby ridge. We have lunch at the picnic area and at 2:05 pm we drive to the Walpa Gorge car park. We plan to do the short walk. It has started to rain slightly as we set off and we run into Peter T and his family. They are staying in fancy accommodation rather than camping as they now have Peter's brother-in-law Ben with them. This walk is said to take an hour but we are back in 50 minutes. We drive back to Yulara and go to the supermarket to restock. Note that while you used to be able to purchase alcohol here, now you can only get from the Outback Bar and this is limited to one six pack of beer and one bottle of wine a day. The beer cost $38!!!!! Make sure you top up in Alice Springs or wherever you come from before getting here. We arrive back at the camping area at 4:30 pm. 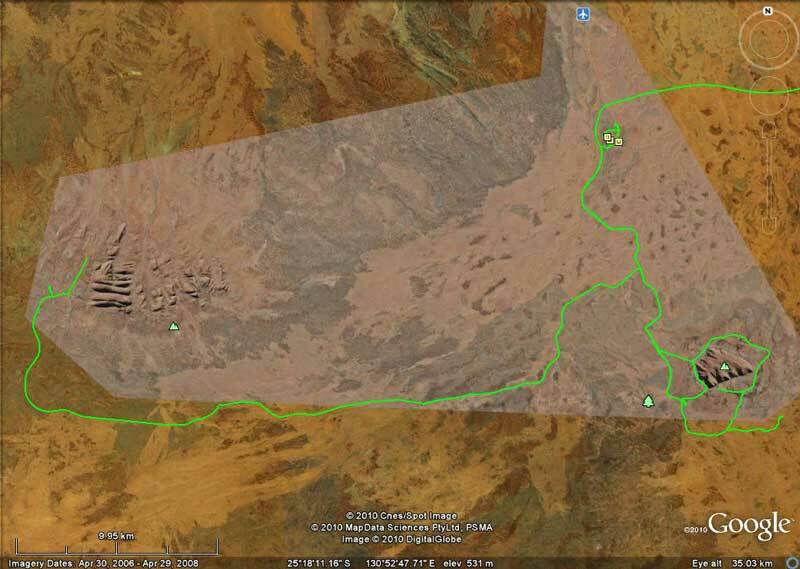 Because of the rain, I need to check on the roads in NT and South Australia for the next legs of our trip. As I suspect, lots of roads are closed. All the SA roads are closed, including the Oodnadatta Track, the roads from the Stuart Highway to the track, the Strzelecki Track and the Merty Merty to Cameron Corner road. 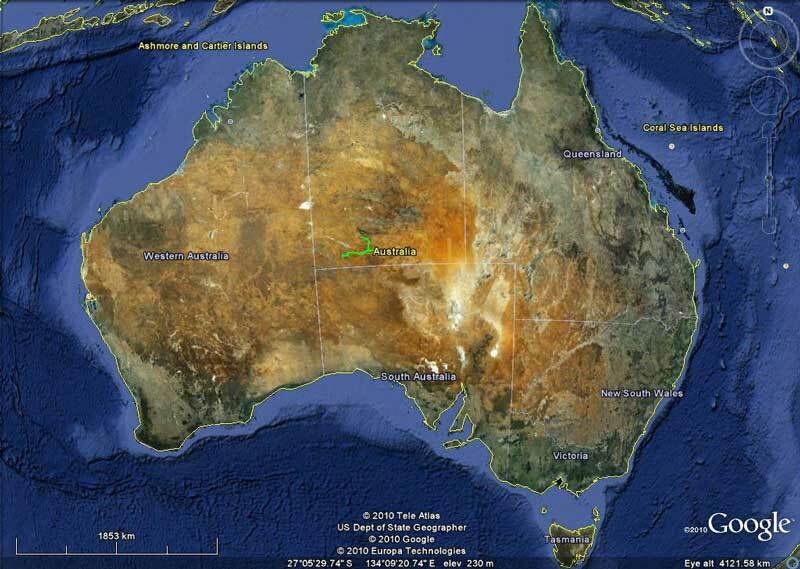 We can get to Henbury Meteorite Craters as well as Chamber Pillars and onto Finke. We read for the rest of the afternoon and then after a shower, I cook a chicken curry and rice dinner. After this we walk to Peter T's unit and have birthday cake for Melanie who is nine today. We are back by 10 pm and go straight to bed. It is raining when we awake so we stay in bed till 8:45 am. The rain eases a little so we get up and have breakfast before packing up. 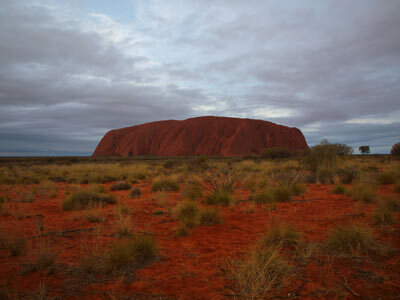 We depart at 9:55 am and head out to the sunrise viewing area at Uluru. This is a new construction. What a waste of money. 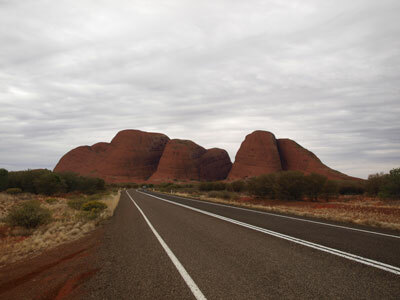 It cost $21 million of our taxpayers' money and includes a road that instead of running straight to it goes around the back of the visitor centre for kilometres. Even when you get there the waste does not stop. The parking area is huge, I doubt that they could ever get any more than a few cars or buses there at a time. 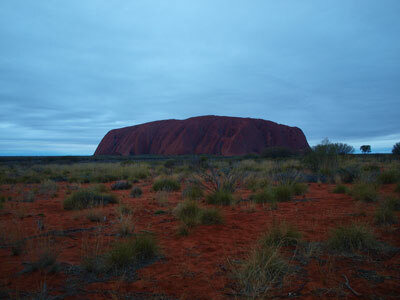 I know no-one who has been to Uluru that has ever gone to watch the sunrise. The viewing area is ever worse. The walking tracks wander all over the place, the main viewing platform has a huge tree that blocks a good part of the view of Uluru. Who the hell thought this was a good idea to waste money on? Think of all the upgrades to country hospitals that could have been done instead. Anyway, that is my rant as I hate to see unnecessary expenditure of public money (and I am a public servant myself). 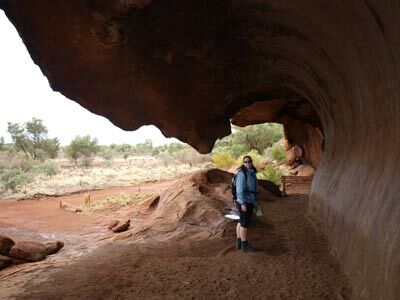 After wasting our time, we leave at 10:40 am and drive to the eastern side of Uluru and do the walk to the Mutitjulu Waterhole that we visited on Saturday. There is more water coming down off the rock and it looks great. We drive around the northern side and again, there is more water coming down. We go to the cultural centre. 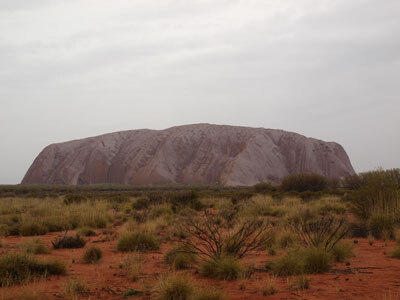 We are disappointed that there is nothing there about the geology of the area, no indication of how Uluru was really formed. It does give a good cultural representation of how the Aboriginals think it was formed. 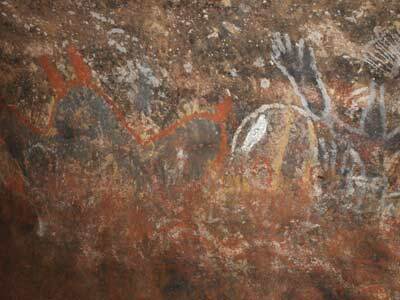 However, the displays are looking old and tired and there are so many photographs of local Aborigines who have died covered up you miss out on a lot of information. We leave at 11:55 am and head back to Yulara and do some last minute shopping for bread etc. We also have lunch in the only cafe in the town. Very quick service and not too bad food. Tomas and Peter F are also here. We go back to the camping area as I need power to use my laptop (it is my very old one and the battery is stuffed) to check the internet. I find that the road from Finke to the Stuart Highway is now closed as is the Ernest Giles Road that gives access to the Henbury Meteorite Craters. 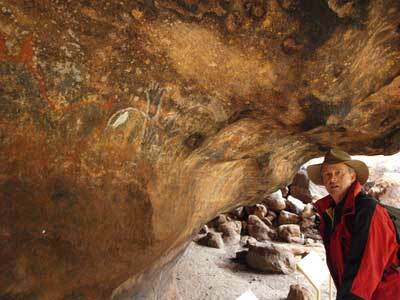 This means although we can still get to Chambers Pillar, we would have to totally back track 250 kilometres. We decide to bypass both and head south instead. Over the past two days Kelly and I have worked out an alternative route home via Port Augusta, north-western Victoria and southern NSW. We decide to head tonight to Erldunda Roadhouse instead of stopping at Curtain Springs. It is now raining quite a bit more as we depart Yulara at 1:25 pm. We have tried to contact Peter T by phone about what we are planning to do but he is not answering. I suspect he is at the airport seeing off his wife Elly so we SMS him. As we pass Curtain Springs at 2:25 pm, we put a note on the entrance to the camping area advising what we have done in case he does not check his phone before getting out of mobile range. Lucky we are not stopping here, it is now a mudhole. At 3:20 pm we stop to cut some firewood and 10 minutes later we are back on the road. At 4:35 pm we arrive at Erldunda Roadhouse. There is only the roadhouse here, which has fuel, a caravan park, motel rooms and a hotel. We book in ($10 per person) and select our spot. The caravan park is a lot fuller than I though it would be. It seems that there is a Trucking Hall of Fame gathering in Alice Springs in a few days and nearly everyone here is going there. There are even some very old trucks. We are having a lamb shoulder from Woolworths. This is marinated with rosemary and wine. There is a big crowd around a fireplace, with some blokes cooking a roast pork leg using a battery powered spit. We put the lamb on using some of the coals. There is a good social interaction around the fire as people gather to warm up and cook their food. There is a huge covered eating area, with lots of tables and chairs and some gas barbecues and we eat our meal there. After dinner we walk to the pub and have a couple of beers while talking to two blokes who are also going to the truckies gathering. There is no sign of Peter T and we wonder if he got our message. We are in bed by 10 pm and soon asleep.